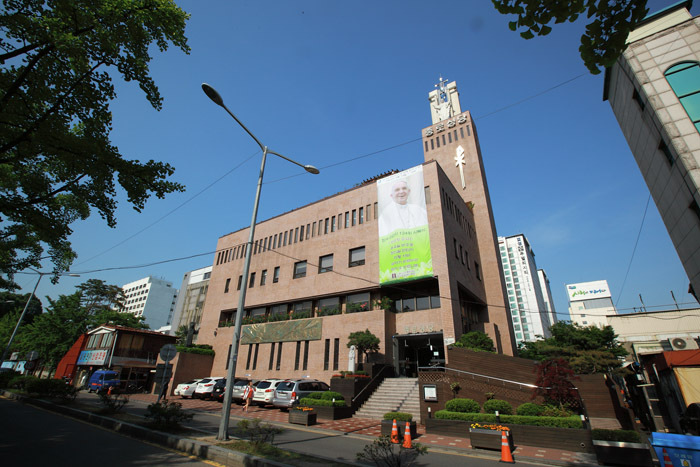 The Archdiocese of Seoul dates back to the 17th and 18th centuries, when Catholicism and religious belief began to spread with the study of Western learning. Yi Seung-hun, the first Korean convert, christened as Peter in Beijing, returned home in 1784 and began teaching the Gospel and baptized other believers together with John Baptist Yi Byeok, creating a new religious community in Seoul. The following year, Yi Byeok led Yi Seung-hun, Francis Xavier Kwon Il-sin, John Jeong Yak-yong, Jeong Yak-jeon and others during religious meetings held at the home of Thomas Kim Beom-u, near what is now the Myeongdong Cathedral. This was the dawn of Catholicism in Korea. Today, a urban walking course, the Gospel Trail, connects the sites of Yi Byeok’s home and Myeongdong Cathedral with Kim Beom-u’s house, among many other holy Catholic places across the city. The street route includes: the Catholic University of Korea’s Songsin Theological Campus Church, where St. Andrew Kim Dae-geon’s remains are buried; the site of the old police bureau, the Jwapodocheong; the Catholic Jongno Church; and Gwanghuimun Gate, the smaller of the eastern gates through which the bodies of the martyrs were discarded after their execution. The Gospel Trail is one of three pilgrimage routes in the Seoul area, along with the Life Trail, running from the Kahoe Catholic Church to the Gyeonggi Gamyeong Site, and the Accord Trail, which goes from the Jeoldusan Martyrs’ Shrine to the Samseongsan Martyrs’ Shrine. All combined, the three routes add up to 27.3 kilometers. Construction of the Myeongdong Cathedral, which stands at one end of the Gospel Trail, started in 1883 when followers began to purchase land in the area. 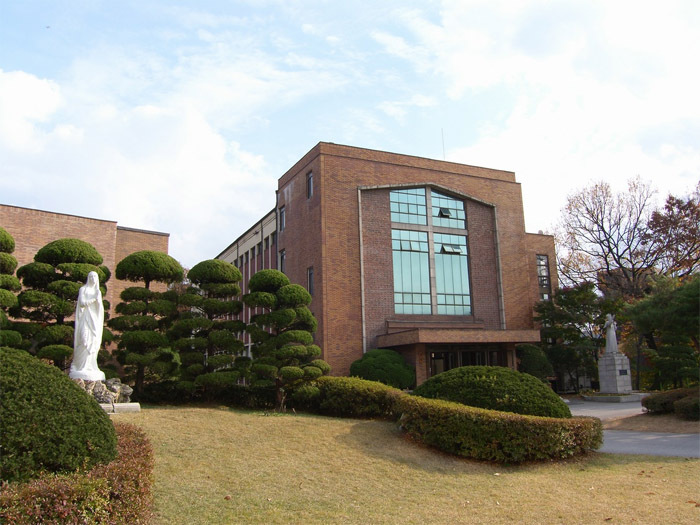 At roughly the same time, Bishop Marie Jean Gustave Blanc established a seminary nearby, the Jonghyeon Theological School. Later, Gustave Charles Marie Mutel took part in the groundbreaking ceremony on August 5, 1892, and buried a list of bishops and missionaries who strived to build Catholicism in Korea beneath the cornerstone. The Myeongdong Cathedral is the first Gothic building in Korea, with a roof 23 meters above ground and a bell tower that stands 45 meters. Father Eugene Jean Georges Coste took charge of designing the church and supervising the construction. It was completed on May 29, 1898, and the consecration was held the same day. After the church was completed, the remains of martyrs who died during the great persecutions of 1839 and 1866 were placed in the cathedral’s catacombs. In all, the remains of five saints and four martyrs are kept in the church. The saints and martyrs include Laurent Joseph Marius Imbert Laurentius, the second bishop of the Joseon Archdiocese, Jacques Honore Chastan Jacobus and Pierre Philibert Maubant Petrus. 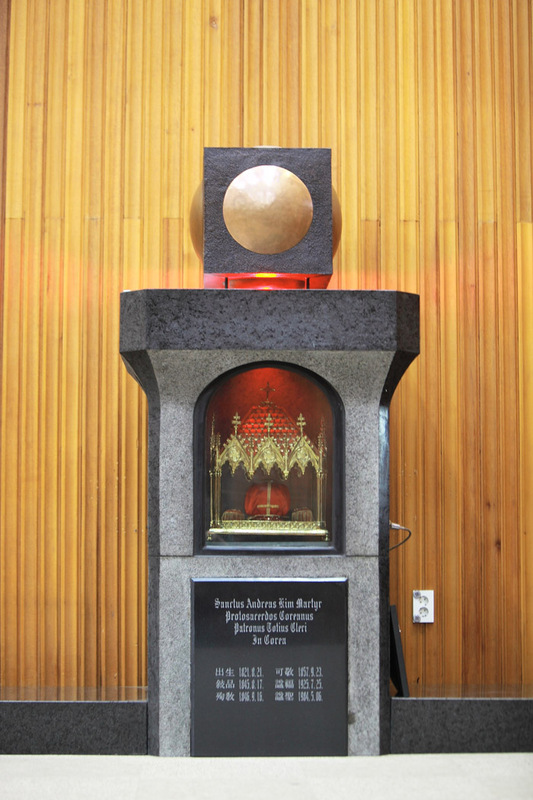 The remains of Korea’s first Catholic priest, St. Andrew Kim Dae-geon, are kept in the Catholic University of Korea’s Songsin Theological Campus Church. The school originated in 1855, coming out of the St. Joseph Theological School at the Shrine of the Baron in Chungcheongbuk-do (North Chungcheong Province). The oldest seminary in Korea, it has produced many clergymen. Pope Paul II visited the church on May 3, 1984, and celebrated Mass. Many martyrs who were arrested in Seoul and Gyeonggi-do were brought to Seoul during the persecutions. They were subjected to severe torture and punishment before being executed. Their bodies were ejected from the city through the Gwanghuimun Gate. The gate, a painful historical location, was constructed in 1396 during the fifth year of King Taejo’s reign, the first king of the Joseon Dynasty (1392-1910). After several alterations, a gate tower was built in 1719 and it was named Gwanghuimun. The gate was restored in 1975 when the Seoul Fortress Wall was rebuilt. The gate house and the stone gate were then reinstated as they are today. Due to the widening of Toegye-ro Street, the gate had to be moved 15 meters southward from its original position. A police bureau, a podocheong, was originally established during Joseon times to simply catch thieves. The Jwapodocheong — –jwa means left — was responsible for the eastern, southern and central areas of Seoul, as well as for the surrounding cities toward the west, such as Ganghwa, Gwangju, Gimpo, Suwon, Anseong, Yongin and Incheon. 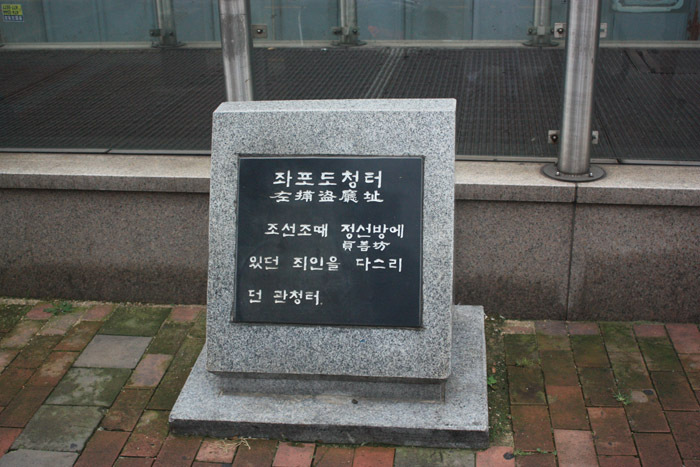 It is believed to have stood where the Danseongsa Theater now stands in Jongno District.